On January 1, 2017, the idea of universal basic income (UBI) took another small but significant leap forward, in Finland. UBI is a form of social security where a government institution pays its citizens a regular, unconditional sum. Finland is testing UBI by handing around $600 per month to 2,000 jobless Finns for the next two years. It’s a bold experiment aimed at helping the long-term unemployed. Finland has an ambitious New Year’s resolution in mind: learn how offering free money for two years helps the unemployed get back to work. Starting January 1, 2017 and lasting until 2019, the federal social security institution Kela will distribute roughly $590 each month to 2,000 jobless Finns. Regardless of whether they find work during that period, the money will keep coming in at the beginning of each month — a trial version of basic income, one of the past year’s most popular theories of how to solve poverty. Under universal basic income (UBI), people receive a standard amount of money just for being alive. By handing out the money to everyone, regardless of their income status, UBI advocates say the system prevents people from falling through the cracks. Marjukka Turunen, head of Kela’s legal benefits unit, says the experiment in Finland should provide insights on two fronts. The first is whether basic income could help clean up Finland’s messy system of social security. Depending on their specific needs, Turunen says residents could be on one of 40 different benefit systems. Each benefit — whether it’s for someone who’s sick, unemployed, a student, or so on— is calculated differently and must be changed when the person’s status changes. “That’s really a burden for customers and Kela to do all those status changes,” Turunen tells Business Insider. A form of basic income could mean people just need to apply for one status indefinitely, no changes required. Turunen suspects the experiment will compel at least a few wannabe entrepreneurs to make the leap into starting their own business — a risky proposition in Finland today since business owners who are forced to close shop don’t receive unemployment benefits. It’s not unlike the system in place in most US states. 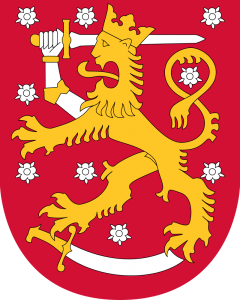 Image: Finland coat of arms. Courtesy: Vzb83 / Wipipedia. Public Domain. Many of us have had interactions — usually fleeting and impersonal — with the homeless. Those of us fortunate enough to have made our own luck (it doesn’t come from the sky) usually find the less fortunate on street corners asking for a donation. Sometimes, some of us may give them a dollar or two to assuage guilt or to just “make them go away”. More often than not we hear voices — sometimes our own — asking, why don’t they just get a job? The Mayor of Albuquerque, New Mexico, Richard Berry, had a novel answer to this question, and it seems to be working. In the process, his program is moving the homeless off the street and, more importantly, delivering kindness and compassion and instilling hope and dignity in some of our most vulnerable souls. Throughout his administration, as part of a push to connect the homeless population to services, Berry had taken to driving through the city to talk to panhandlers about their lives. His city’s poorest residents told him they didn’t want to be on the streets begging for money, but they didn’t know where else to go. Seeing that sign gave Berry an idea. Instead of asking them, many of whom feel dispirited, to go out looking for work, the city could bring the work to them. Next month will be the first anniversary of Albuquerque’s There’s a Better Way program, which hires panhandlers for day jobs beautifying the city. In partnership with a local nonprofit that serves the homeless population, a van is dispatched around the city to pick up panhandlers who are interested in working. The job pays $9 an hour, which is above minimum wage, and provides a lunch. At the end of the shift, the participants are offered overnight shelter as needed. In less than a year since its start, the program has given out 932 jobs clearing 69,601 pounds of litter and weeds from 196 city blocks. And more than 100 people have been connected to permanent employment. There is a persisting stigma that people begging for money are either drug addicts or too lazy to work and are looking for an easy handout. But that’s not necessarily the reality. Panhandling is not especially lucrative, but for some people it can seem as if it’s the only option. When they’ve been approached in Albuquerque with the offer of work, most have been eager for the opportunity to earn money, Berry said. They just needed a lift. One man told him no one had said a kind word to him in 25 years.